This is a general and simplified Time Clock Interface that will only allow 3 functions: clock into the company, clock out for meal breaks and clock out at the end of the day. 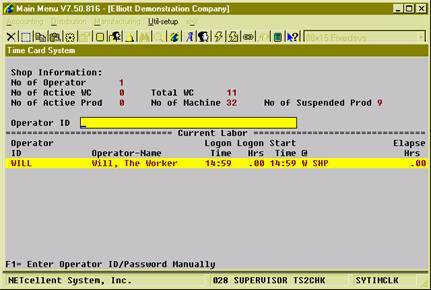 It is similar to a time card system used in most companies to record an employee’s time and is independent from production. 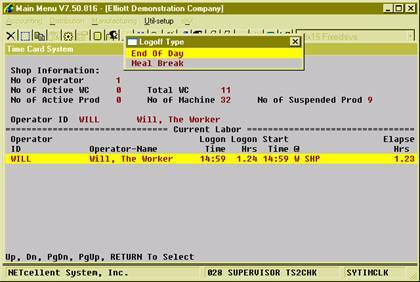 This interface can be used for office employees who are not directly related to production. A computer can be placed at the company entrance for everyone to clock in each morning and clock out at night. Anyone who clocks in through this interface can still clock into a work center or department and report production through Work Order Production. Once time is recorded, the system will display basic statistics about the production department at the top of the screen and list all operators who are currently in the company, no matter which work center or department. Like all the other time clock interfaces in WO+, the employee can type the ID and password or scan a barcoded badge. If the employee is not clocked in, the system will clock in. Otherwise, the system will clock out the employee and ask whether it is for a meal break or end of day.